I have a major sweet tooth. I absolutely love over indulging it too, let’s be honest, don’t we all? I love smooth, creamy chocolate and when I’m reaching form something to give me that sweet little pick me up, chances are, it’s going to be Lindt. Lindt chocolates are easily some of my favorites, especially the balls. Yes, I did just say that. Solid outer shells and a smooth creamy inner. Yes, I did just say that as well. It’s chocolate, it’s euphoric and tantalizing! I always treat myself to a box or three when they’re on offer that’s for sure! I’ve recently signed up for Bzz Agent, where you get to sample goodies and share your opinions on them (wait, that sounds kind of like what I do already! Hurrah!). One of the campaigns I was lucky enough to be invited into was the Lindt Hello campaign. Hello is Lindts newest range; five friendliest friends that are eager to sweet you indeed. Let’s start with the packaging, I’m a sucker for the aesthetics! Sleek, black and shiny, these instantly look high end, yet the quirky writing and cute little quotes make then so much fun and instant conversation starters – meaning they’re the perfect way to say hello to that cutie you’ve been too shy to talk to or for sharing with friends you haven’t seen in a while…if you can share the goodies that is! The range is pretty extensive with 5 mouth watering flavours; crunchy nougat, salted caramel, strawberry cheesecake, cookies & cream, and caramel brownie. They sound more like cake fillings than chocolate bars that’s for sure! Each bar is 100g, 10 squares so there’s a lot to go around! The full sized bars are not exactly designed for solo indulging, so luckily for our waistlines, they’ve also brought out every flavour in a 6 square, 39g bar. 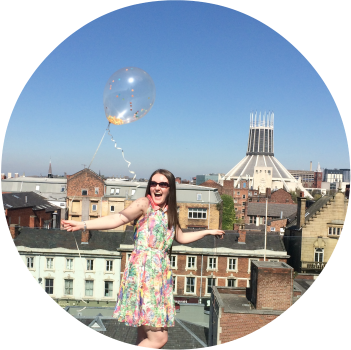 In the interest of blogging (damn, I love that excuse!) I, of course, had to try out every flavour in order to bring you a very scientifically accurate, food critic worthy opinion…and I really, really just felt like some chocolate! Seen as though they're for sharing, I got trusty Dad to come along and try them out too, so you'll get his opinions too! She said…Probably the most disappointing of the bunch, lots of yummy Lindt milk chocolate and lots of little crunchy nougat bits in but nothing special. 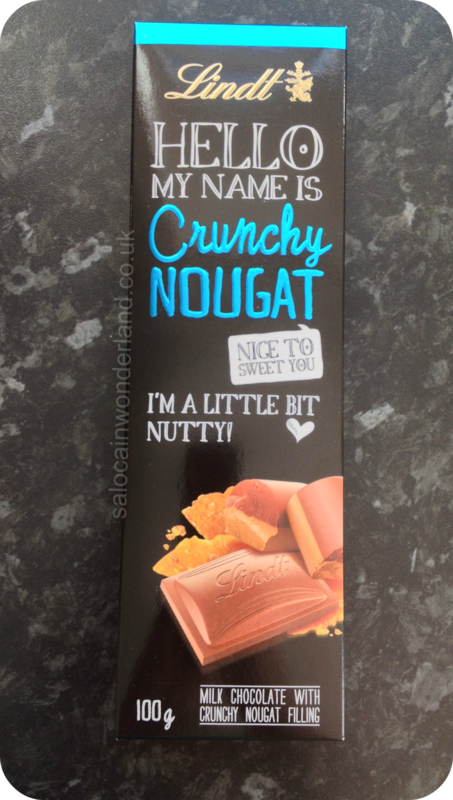 Never really been a fan of nougat, there’s just not much going on! He said…I've no idea what flavour that's suppose to be, it tastes alright! Quite like it actually! Actually, I think this one is my favourite. 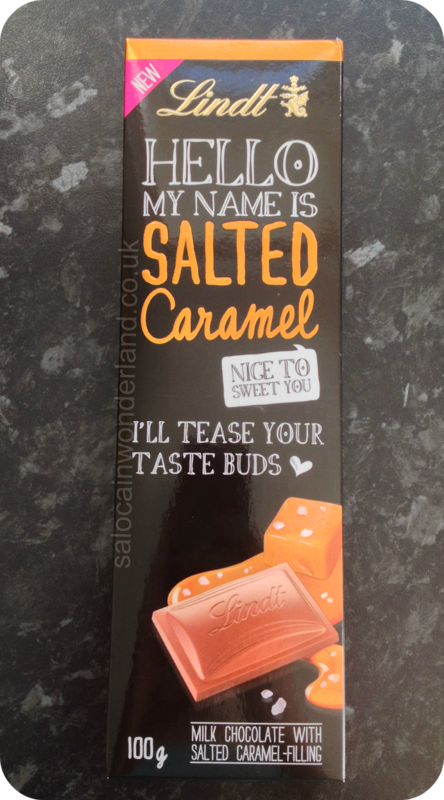 She said…Ohhh I love me some salted caramel and this one is divine! The caramel is so smooth and it’s actually not that salty, which I like. It doesn’t leave that pinch at the back of your throat you sometimes get with caramels. He said..Yep. That tastes nice. Very caramel-y! She said…First off, this one smells the best out of the whole bunch! I could sit and sniff it all day if I wasn’t so desperate to eat it! You can really smell the strawberry cheesecake, the milk chocolate is barely and after thought. These are so creamy and the strawberry pieces are a tiny bit crunchy with a really tart flavour, they taste so fancy! He said…Yeah, that tastes nice! 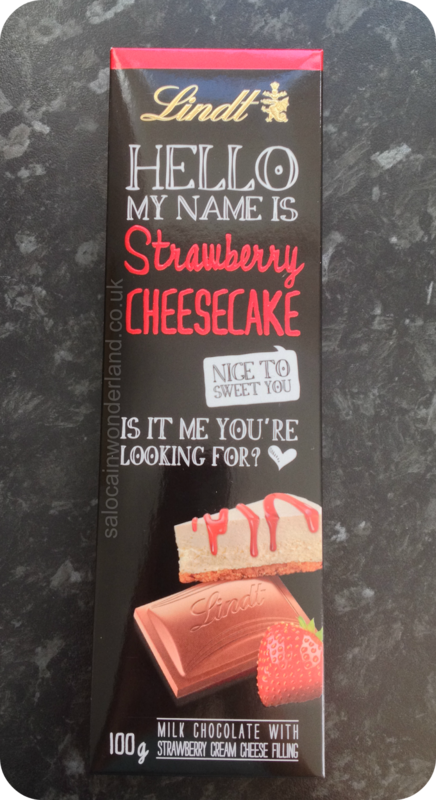 Strawberry cheesecake is generally my go to for cake too! She said…Cookies and cream has always been my go to flavour for anything and everything. When Dairy Milk brought out the Oreo filled bars, oh me oh my, I felt like I’d hit the jackpot! Well, I can’t believe I’m saying this, but this one is so much better. I think it’s because I prefer Lindts milk chocolate, but the cookie pieces are more like chunks – and you can’t go wrong with chunky cookies! He said…Nice, but it doesn't really have as much flavour as the others. She said…More chocolate, less caramel, not that that’s a bad thing. It really does taste like chocolate browies with a thin, slightly thicker in consistency layer of caramel on the top. 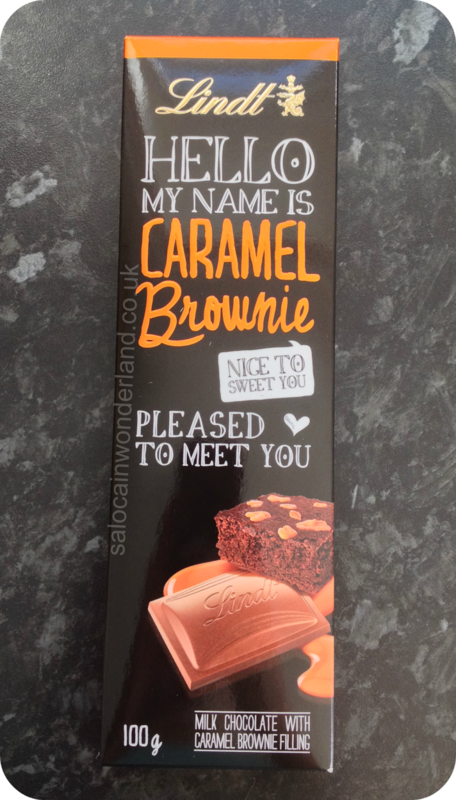 He said…Nowhere near as much caramel as the salted caramel flavour, that's a good thing. Oh, the things I do for you people! 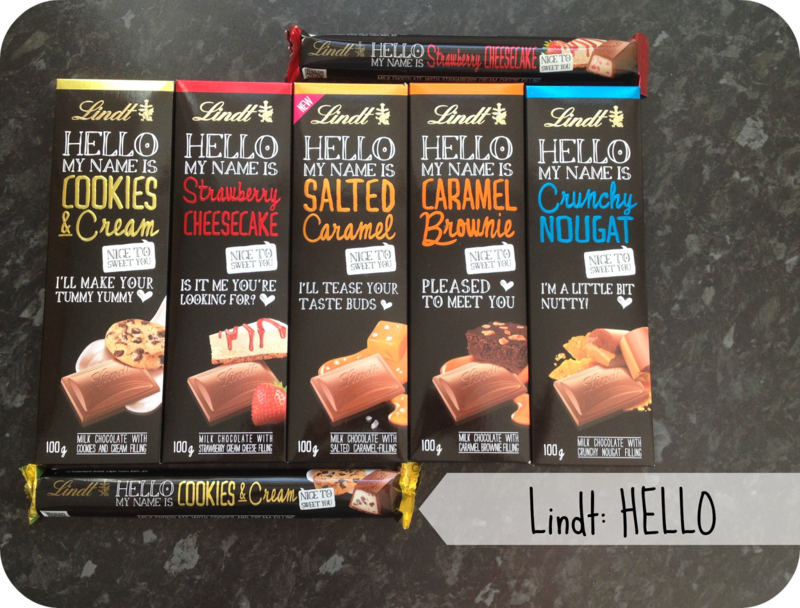 I think it’s safe to say I’m pretty impressed with Lindts new range, I’d be happy to say Hello any time! 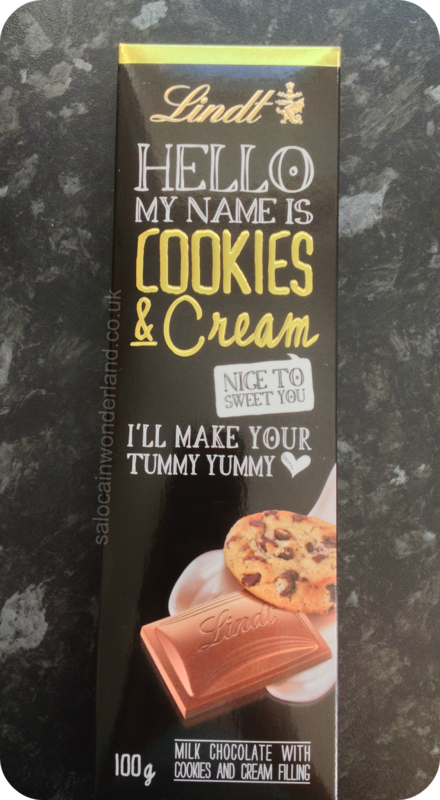 Have you tried anything from the new Hello range by Lindt? Let me know in the comments below! oh wow! my mouths watering reading this post! ahh the carmel brownie looks incredible! They're all so scrumptious! Not the healthiest of treats but they taste SO good! They all sound delicious!! :D I don't think I could easily share any of those flavours! hehe. Sooooo tasty! I think there still might be one or two at the back of the fridge...actually, I might go investigate that now I'm thinking about it! I love lindt chocolate but after a square I'm always 'done'. Just ONE square?? I wish that worked for me lol! Then again if I eat more than a few I end up feeling sick...why can't I stop myself?? I'm a damn glutton lol!